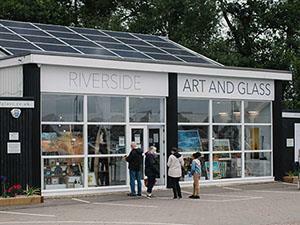 Riverside Art and Glass represents over 60 painters, ceramicists, printmakers and glass artists. Many artists are local with international artists represented too. The gallery prides itself on sourcing artwork that is stunning and affordable and is sure that, whatever your budget, you will find something you love.The Gallery also operates the ‘Own Art’ Scheme, which is supported by Arts Council England. The scheme enables purchasers to buy pieces over £100 in 10 interest free monthly installments making it easy and affordable to buy contemporary works priced between £100 and £2500. The light and airy gallery has recently added a new exhibition space, which is available for hire. There is also an outdoor sculpture area. The gallery offers framing services and its friendly gallery team have a wealth of knowledge to help you find artwork to treasure. We have free car parking at the front of the gallery for customers. From Wroxham train station, turn right down Station Road, at the end turn right and cross the road to the footbridge. Once over the foot bridge the Gallery is 50 yards on the right. Buses from Norwich run directly outside the gallery on Norwich Road in Wroxham. The number 53 Anglian Bus or the 12/12A First Bus run regularly. The River Bure runs directly opposite the gallery and so the gallery is also reachable by boat!